I love smoothies because they are a great and simple way to get the extra nutrition you need. This smoothie has raspberries, blueberries, fresh rosemary and a few other ingredients. I have made this smoothie and it’s excellent. I like to add a little coconut oil to make it more nutrient dense. The fresh rosemary contributes a wonderful taste and some major health benefits. 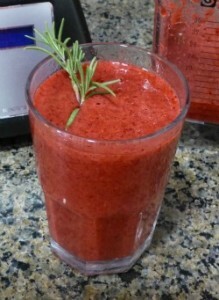 Click on the Raspberry Rosemary Smoothie Recipe link below to see this tasty recipe.